Finally the Royal Enfield Classic 500EFI appears in India after its first revelation in Germany followed by the subsequent launch for the European market. It is the first bullet in the country to be launched with the fuel injection. 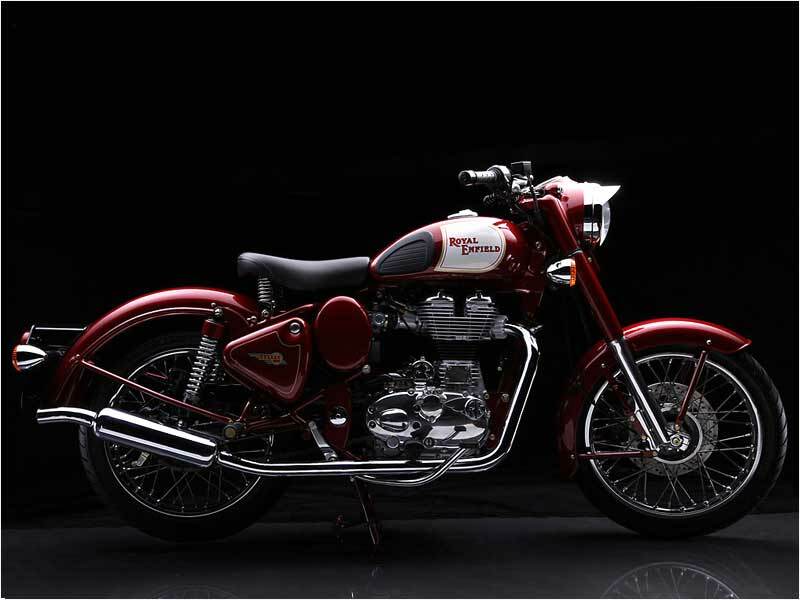 This powerful machine will be sold in India as "Royal Enfield Classic" getting the tag description "Bullet" removed. In consideration of the Indian buyers, Royal Enfield has rolled out Enfield Classic in two models as Classic 350 and Classic 500 so that the Indian bullet fans can own either depending on their affordability. This technologically improved motorcycle is sure enough to be a big hit in the country given the fact that there are already hordes of die hard bullet bikers who have been awaiting the launch of this dream machine. The Bullet Classic 500 EFI is pegged as the most powerful Bullet unleashing 27.2bhp at 5250rpm and a whooping torque of 41.3Nm at 4000rmp. In the heart of Royal Enfield Bullet Classic 500EFI rests the fuel injected 499cc, single cylinder UCE (Unitary Construction Engine) four stroke engine. The clutch and gearbox are loaded outside and they are both converged into the crankcase. According to Royal Enfield, the UCE construction is to ensure less moving parts, less transmission and better maintenance. The EFI engine is loaded with a 5-speed gearbox. Scrapping the age-old carburettor version, the new age Enfield Classic 500 EFI is now sure to offer better air-fuel mixture, smoother operation, better power delivery and cleaner emissions. The Royal Enfield now adopts a new 18" wheel in place of its traditional wheel size of 19" with the Avon tyres for better ride and handling. The Pagani turn signals are simply eye popping. The headlight with the tiger eye lamps gives a macho look of the machine. As traditional the headlamp is, it owns a halogen bulb to lend good illumination. The antique tail lamp assembly silhouettes the classic design. The well sculpted fuel tank with the pristine graphics along with the high pads evokes the vintage look on the bike. It also features hand-touched up aluminium castings and hand-lined gas tank. The toolbox and the air filter box both add up to the classic look and design of the motorcycle. The speedometer coupled with the fuel indicator is housed into the die-cast headlight casing. The speedometer with the classic English font and the mudguards with the classic touch are all designed appropriately for the utility purpose and the authentic look of the bike. The well chiselled silencer with the 1950's look is also available as an optional accessory for off-road use only. 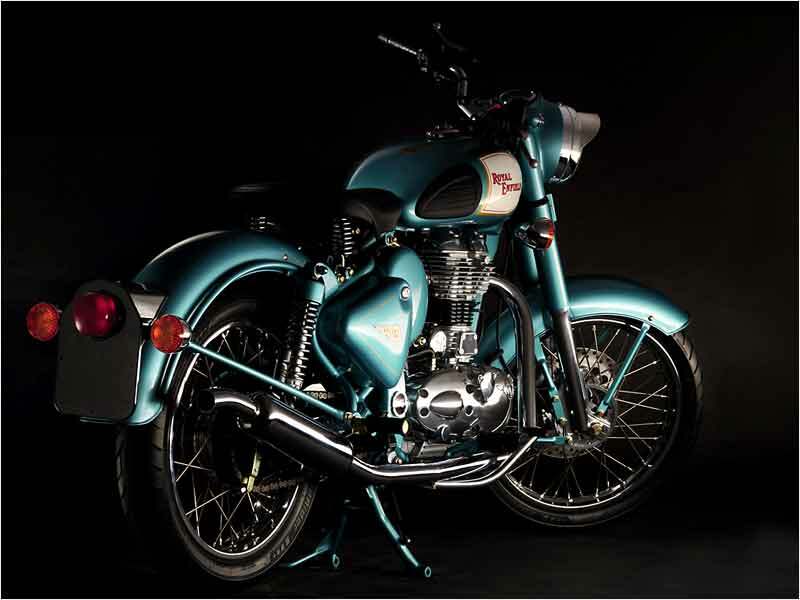 The look and design of Enfield Classic 500 is a good combination of both classic and the new age contemporary look. The seat in the Classic 500 is a single type and it renders maximum comfort with the high end heaven bound ride. The mudguards are deeply drawn and wide and offer a splash free ride. With the generic wheel size, the handling is more comfortable along with the improvement in speed. The new machine can gain a maximum speed of 129 kmph with the claimed fuel efficiency of 28.5kmpl. As the new Bullet Classic 500 EFI comes with the electric start, the kick start difficulty is ironed out. The 280mm disc brake at the front shows its functionality in all riding conditions. It brings the bike to a halt without any complaint. The motorcycle now boasts of the international standard technology and the top end ride quality for which it deserves the price available in the market and worth of owning for our personal proof and evaluation. As a comfortable bike with excellent design and single saddle seat, Royal Enfield Classic 500 offers an average bike mileage of 32-35 kmpl. 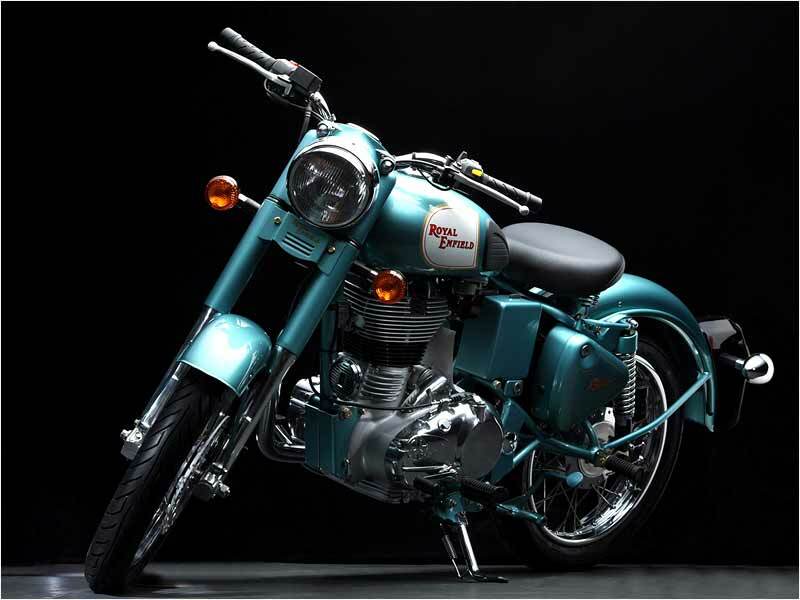 The Royal Enfield Classic 500 is available for Rs. 1,24,000 in the Delhi ex-showroom and the on road is expected to be around Rs. 1,40,000. It is available in the colors of Red, Black & Green.